• Real-Time Graphing and Logging through Web Browsers. • Firmware can be flash upgraded from remote. • Manages concurrent client connections safely and reliably. • Debugging functionality helps simplify software integration. • 3 separate 1-Wire networks providing robust communication. • Automatically provides smart strong-pull-up for 1-Wire sensors. • Fast WiFi network configuration over micro USB. • Reports the 1-Wire network connected to each device. • Automatic short detection on 1-Wire networks. • 1-Wire MicroLan capacity of 1000 feet of cable, 22 devices*. • ESD Protection more than 27kV (IEC801-2 Reference Model.) on the 1-Wire bus. • LED indicators for Ethernet link/activity, power, and 1-Wire activity. The OW-SERVER is an inexpensive Ethernet/WiFi to 1-Wire interface that is designed to efficiently monitor and control 1-Wire devices. The OW-SERVER will allow you to use industry standard Ethernet or WiFi products (switches, hubs, etc.) to build the backbone of your 1-Wire based sensor / control system. This provides several important benefits: First, 1-Wire networks can be easily distributed over great distances without having to deal with the challenges associated with the installation of physically large 1-Wire networks. By distributing the 1-Wire networks, the individual 1-Wire MicroLans can be kept to a smaller physical size, thereby improving responsiveness/reliability and decreasing installation costs. Second, since the OW-SERVER communicates over standard Ethernet/WiFi, you can take advantage of existing corporate LANs, WLAN, the Internet, and in-house MIS expertise for building out and maintaining the backbone of your sensor network. Overview Page - containing primary attributes (e.g. ROM Id, Device Type, Temperature Readings) of each sensor, a graph of all the sensors with the user selected value (e.g. Temperature, Humidity, Light Level, Latch State) and a "Download" button for exporting the graph's data in a CSV format. Sensor Pages - includes all of the sensor's data, a graph of up to three user selected sensor values and a "Download" button for exporting the graph's data in a CSV format. Advanced Details Page - contains all of the data from the connected sensors. AJAX techniques automatically updates the information insuring the data being displayed is current. The SNMP interface is divided into 3 sections: edsEnterprise, owTrap and owDevices. The edsEnterprise section presents basic product information, such as name and version. The owTrap section is where you define the IP address the trap should be sent, the high alarm, low alarm, and the hysteresis. The owDevices section data similar to the Overview and Devices webpage. * The number of supported devices was reduced to 22 with the release of firmware version 1.34. I have a couple of other questions about your DS2423 based anemometer. Is it using both of the external counters or a single one? If both are used, do the two external counters agree with each other? Who is the manufacturer of the anemometer? Do you have some logs/graphs of the DS2423 data? I'd like to get some more context to the data? Q: I need firmware version 2.11 or greater to work with OWFS. Can you send it to me? A: Thanks for the answer. Counter A and Counter B inputs are paralleled as is standard on Hobby boards wind board. I monitored the ds2423 counts on the EDS monitor page and the counters themselves jump up by hundreds so your info is accurately passing on the actual reading of the counters. When this even happens though, your health indication drops to 6 so it was a simple matter of keeping an eye on the health before using the reading. Should have been doing that anyway so all OK thanks again. 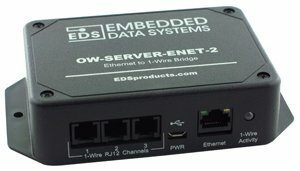 Q: How many sensors can I connect to OW-SERVER? 22 per port or for the entire OW-SERVER? A: You can reset the OW-SERVER’s password by performing a factory reset. Instructions for complete the reset are available here. Q: How do I update my OW-SERVER’s firmware? A: The OW-SERVER-ENET-2, OW-SERVER-WiFi-2G, OW-SERVER-WiFi-2, and OW-SERVER-WiFi can be updated using the web browser interface following the steps below. Using the Windows Command prompt, go to the directory you have the latest firmware (e.g. OW_Server_Firmware_Enet_TFTP_v2.14.hex). Then send the following command substitute the correct IP address and file name "tftp 192.168.1.25 put OW_Server_Firmware_Enet_TFTP_v2.14.hex". Q: Why are the DS18B20 and/or DS18S20 temperature readings not updating? A: The underlining cause of the error is the VDD (power) pin not being connected to ground or 5V+. This will cause the DS18B20 (or DS18S20) to have a "power-on reset" occur during most temperature conversion attempts. 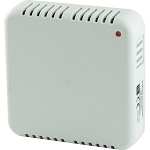 The DS18B20's temperature register will read 85°C following the power-on reset. The OW-SERVER filters out the response as invalid which can lead to a DS18B20 (or DS18S20) not being updated regularly. If the OW-SERVER has never gotten a valid temperature reading from the DS18B20 (or DS18S20) it will be reporting 0.0°C. Q: Why is my DS2438 reporting an invalid humidity reading? A: There are a variety of DS2438 based humidity sensor designs. The OW-SERVER assumes the DS2438 follows AAG’s TAI8540D. Humidity readings from other DS2438 based sensors can be calculated using a combination of the VAD, VDD and/or VSense values. Please contact the sensor manufacturer for details. Q: How do I perform a factory reset on the OW-SERVER-ENET-2 and OW-SERVER-WiFi-2G? Thank you for the inquiry. Here is a copy of a Sample Details.XML with all sensors types. Please note the comments in the file are not included in the OW-SERVER's regular details.xml files. EDS XML Reader (Java) - collects sensor data from a MeshNet Controller or OW-SERVER and presents the information in a CSV format.